Honda has released specification details of its new CR-V SUV - with prices starting at £25,995 when it arrives at dealers in September. Initially only available with a 1.5-litre petrol engine, a hybrid version will arrive in 2019. If you're after a diesel engine, you'll have no choice but to look at rivals such as the Skoda Kodiaq and Nissan X-Trail. 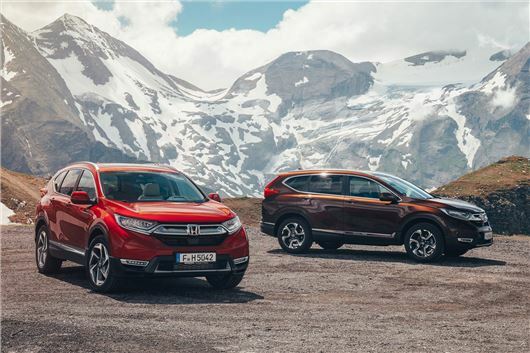 The old model, on sale since 2012, currently has a start price of £24,060 - nearly £2,000 less than the new CR-V. Honda says the higher list price of the new CR-V is reflective of the higher amount of standard kit. Standard equipment across the range includes parking sensors and a rear-view camera as well as a host of safety features including a collision mitigation braking system, adaptive cruise control and traffic sign recognition. SR trim starts at £31,435 and adds smart entry and start, leather interior, active cornering lights and front windscreen de-icer, while top-spec EX is priced from £34,145 and includes a heated steering wheel, head up display, hands free access power tailgate, heated rear seats and panoramic glass sunroof. Buyers get a choice of two- or four-wheel-drive as well as manual or CVT automatic transmission and five- or seven-seats. The range tops out at £36,455 for a four-wheel-drive EX with the CVT gearbox. As well as list prices, Honda has also confirmed that the CR-V will be available for £279 a month on PCP finance based on 10,000 miles a year for three years with 6.2 percent APR interest. That's for an SR trim with four-wheel drive and a manual gearbox.